Join us on an exciting food adventure in the beautiful mountainous region of Haute Savoie. With picturesque Lake Geneva (Lake Léman) and dramatic Alps rising from green pastures, this is the source of France’s fresh mountain waters including world famous Evian. Meet local people who will show us what aperitif is and how to eat cheese like the French. Relax and don’t worry about finding the interesting spots and people in another language. We have you covered. Fromagerie (cheesemakers) to watch and learn how they make Reblochon, Abondance, or La Tomme de Savoie, as well as meet their specialized herd of cows and taste cheese of course (including a fabulous cheese fondue made from their own cheeses)! A stop at the boucherie/charcuterie will show us the traditional craft of making delicious sauccison sec (cured and dried sausages), jambon cru (similar to prosciutto), as well as a plethora of pâtés, terrines, and other meat delicacies. Wine is an important part of everyday life and we will travel up the lake to the beautiful terraced vineyards of the Lavaux region in Switzerland. In this Unesco World Heritage Site the beautiful vineyards produce small batches of delicious wines of exceptional quality that you have probably never heard of because they are almost all consumed within Switzerland. The Chasselas grape produces a crisp, dry, easy drinking mineraly white wine. We will walk along the hiking paths through the terraces overlooking Lake Geneva as we sample these hard to find wines. French bakers have been refining their craft over the centuries and we will watch as they explain their special flour mixes, long fermentation, and age-old techniques of mixing, shaping, and baking and how they bake bread in a modern world. We will join chocolatier Jerome Chaumontet of the celebrated Chaumotet & Co for a special cooking class with a focus on single origin chocolate and pastry. The Alps are fantastic place to hike, with beautiful views, the ringing of cow bells as they graze the lush pastures, and perhaps even a chance to see a chamois or Ibex. 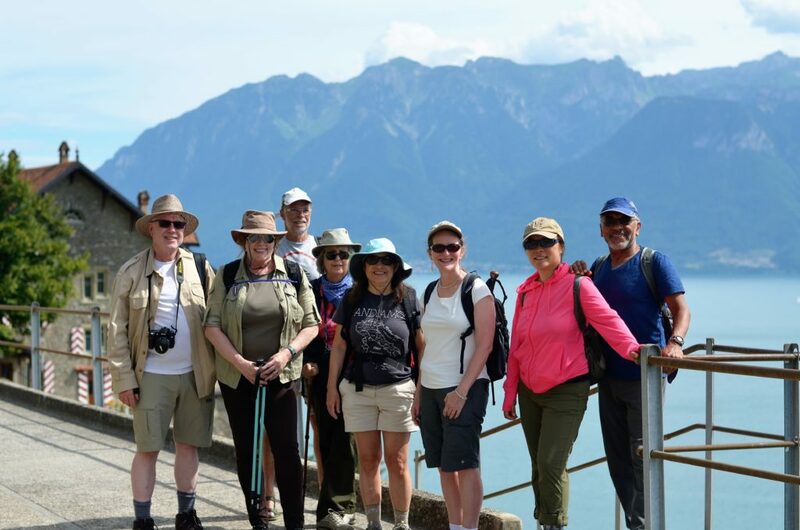 We will have several hikes that are somewhat strenuous but relatively short and allow us amazing views of Lake Léman (Lake Geneva) and even Mont Blanc. We will also hike into the summer pastures, high in the Alps where herders traditionally brought their herds and flocks up to graze on the rich; succulent grasses and wildflowers and make cheese. 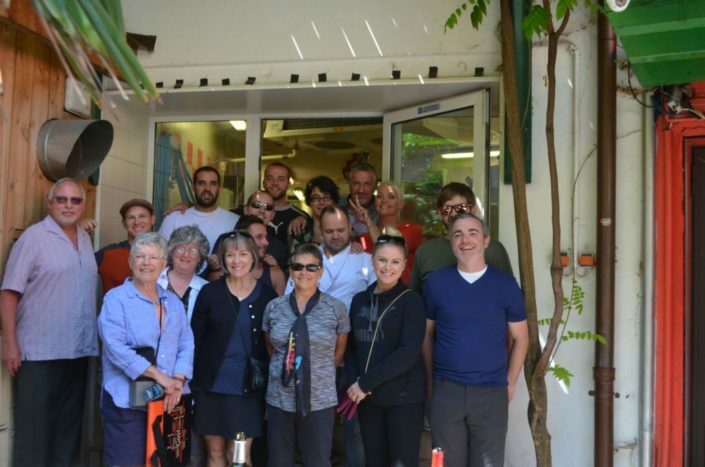 We will also tour a French market with a Chef and then participate in a cooking class to create and enjoy a 4 course lunch. There is also a visit to a duck Foie Gras producer (optional), and we will experience French culture by sipping a strong coffee in a café while talking and people watching. Accommodations include local hotels, and “Chambres d’hôtes” (Similar to bed and breakfasts). Meals will be eaten in hosted French homes, at the Chambres d’hôtes, as well as several restaurant outings, and mountain picnics. Hike through green mountain pastures while coy French Abondance cows look on. 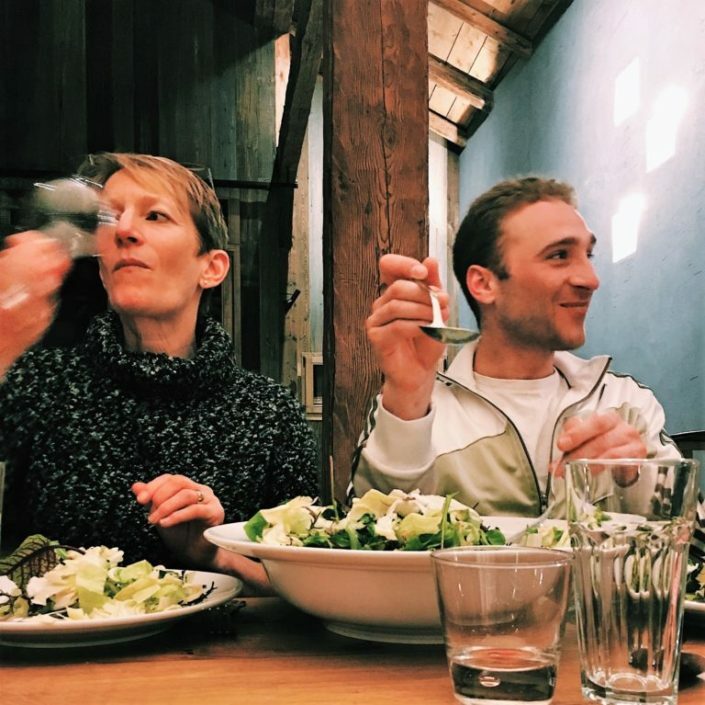 Eat a rustic lunch in a traditional restaurant d’ouvrier, a humble working persons restaurant serving a fantastic 4 course meal. 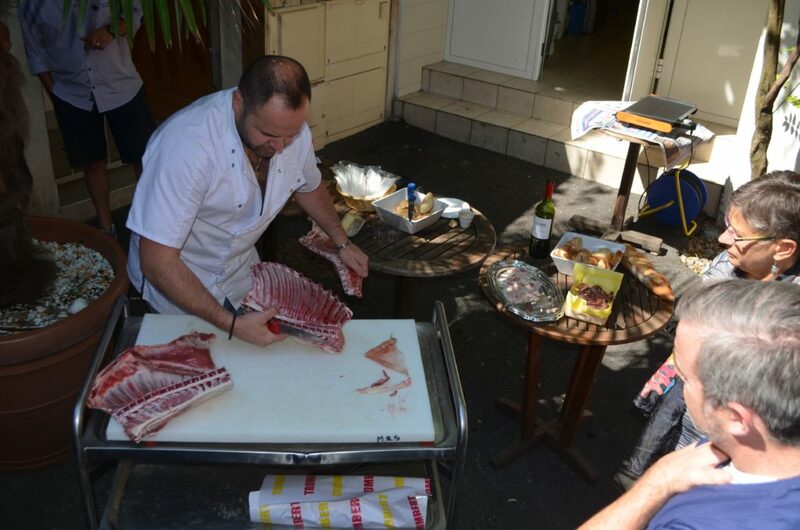 Dine at a gourmet restaurant and enjoy sophisticated French cuisine. Visit a beautiful medieval village situated on the shores of Lake Léman. Sip cold spring waters from the famous Evian fountains. Be invited into a French farmhouse for a home-cooked meal and charming and exciting company. Join French farmers over a glass of wine and taste the fruits and vegetables of their labor. This tour is a “Culinary Adventure” and retains some of the attributes of an “adventure.” There is some flexibility in the schedule to allow for spontaneous events, such as being invited for dinner at someone’s high mountain chalet, taking a boat ride on Lake Léman, an early morning baking session, or a starlit hike. The schedule is generally rigorous with several early (7am wakeup) mornings and late nights (meals until midnight) and usually some sort of physical activity. However, there is time to rest and relax and the tour can be tailored to the groups needs and desires. Each tour is unique. Van transport to lodging Hotel Ibis, Thonon-les-Bains, France (1h15). Rest, relax, and recuperate or visit downtown, spring, spa, etc. Drive to Lavaux wine region in Switzerland (1.25 hours). Wine tastings Domaine de Daley. Visit to Evian-les Bains, Famous Evian spring. Mont Forchat hike (about 2-3 hours), picnic lunch. Check into lodging “Au pré de la Basse.” Orcier, France. 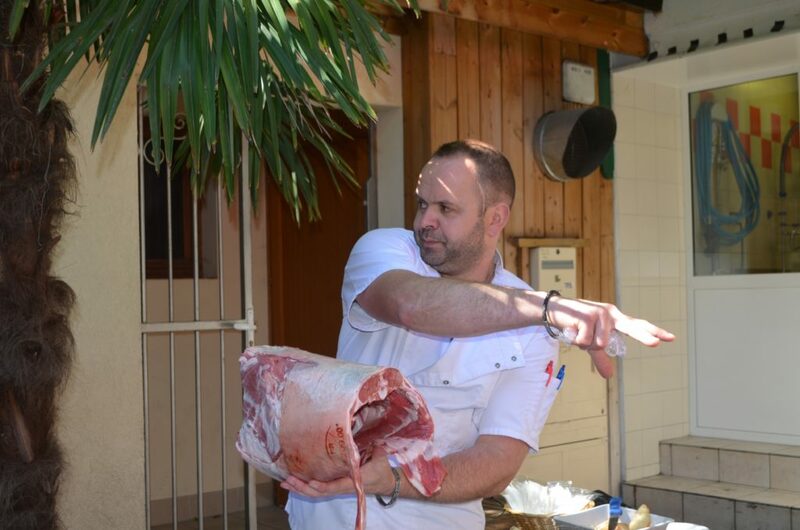 Boucherie/Charcuterie Trombert (Thonon-les-Bains) –Hervé Trombert will lead general tour and explanation, demonstration, and tasting. 10:00. Breakfast at Au pré de la Basse. Comptoir des Saveurs (Thonon-Les-Bains). Tour of pastry production kitchen, French Macacron demonstration with Sebastian, tasting. Cafe. 2 hours. 10:30. Lunch Chez Dret (working person’s 4 course lunch). Visit to the beautiful medieval town of Yvoire or *Optional visit to “La Mere Gaud”-Duck foie gras producer. Baillaison, France. Free afternoon to discover Yvoire. Last entry to Garden of the 5 senses at 17h30. 4 course lunch from cooking class. Tour of rural French Supermarket (“Super-U” in Vinzier) and discussion. Do you have to speak French to go on this trip? No! French language proficiency is recommended but not required. Even if the only French word you know how to say is croissant you will be fine. We will help with translations and in ski towns many people speak English. The weather in Haute Savoie France in July is usually quite warm, with highs in the mid 80s (Farenheit) and lows in the 50s. When we are staying in the mountain town of Abondance lows can dip into the 40s on occasion and it does sometimes hit the 90s in Thonon. Shorts are appropriate most of the time and clear, blue, Lake Geneva is fantastic for a swim if it gets really hot! Is the schedule relaxed or rigorous? This trip has a reasonably rigorous schedule as their are so many interesting and fun things to do. Many of the food producers we will visit begin their days quite early so we will have some early departures (like leaving the accommodations by 7:30am). The French tend to dine later than Americans so there may be some later nights (possibly returning back to the accommodations as late as midnight). However there is rest time built into the schedule and some of the activities can be skipped or shortened. Also the schedule can be tailored to each group’s needs and desires. What are the hikes like? This trip has several hikes of moderate difficulty that can include rocky terrain and elevation changes with steeper uphill sections and descents. You should have some experience hiking and should be able to hike for 30 minutes without having to stop. Please plan on being in shape when you arrive for the trip. Try to do 30 minutes of aerobic activity 3 times a week leading up to the trip. Cheese! Wine! Crusty bread and saucisson! Alpine views! Friendly French people! Did I mention cheese? These are a few of the reasons travelling with Aaron and Saveur the Journey was such a delight. 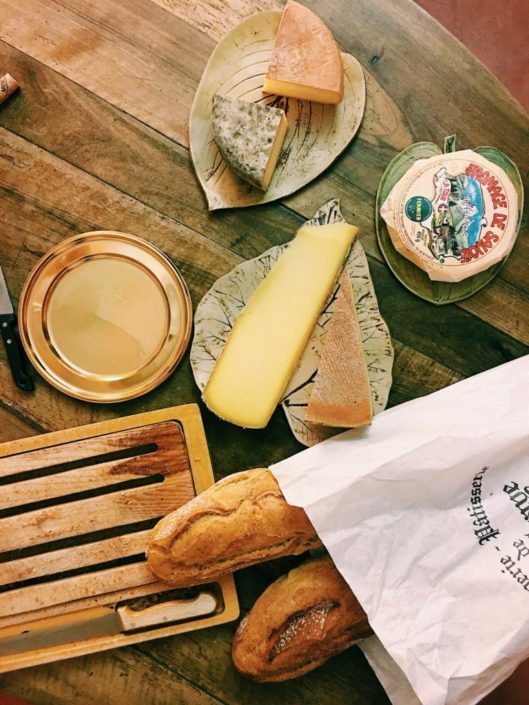 Our tour was a deep dive into the food culture of the Haute-Savoie with a visit to a boucherie, a boulangerie, a charcuterie, a foie gras producer, a fromagerie and a patisserie where the artisanal producers shared their passion and expertise as well as their products. 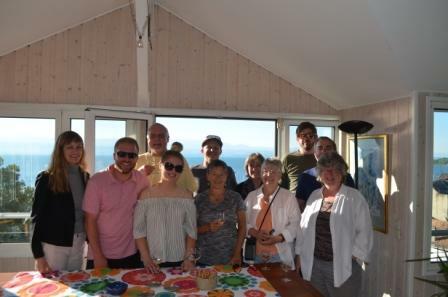 Our small compatible group of travelers enjoyed meals in private homes and gardens or at unique establishments off the beaten track. Aaron’s relaxed manner and intimate knowledge of the people and food culture of the area made for a unique experience. His love for the people and their way of life was infectious. 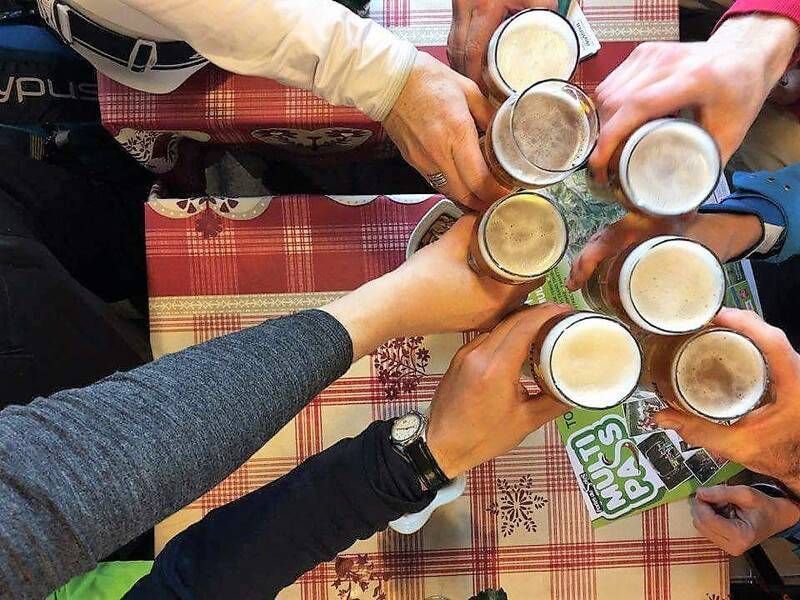 I particularly appreciated the mix of lodgings including stays in an Alps ski lodge, a charming hillside chambre d’hote, and even a stately chateau on the shores of Lac Leman. When we weren’t eating or learning from one of the food producers, we were hiking and picnicking on Mont Forchat or swimming in the lake or sampling the famous Evian water. It was truly an extraordinary adventure. Lac Leman (Lake Geneva). We were treated to wine, cheese, conversation and beautiful views on the ship. I had the time of my life! Aaron has lived and worked in this part of France and has maintained those personal and professional connections…all of which contributed to the unique authenticity of the journey. 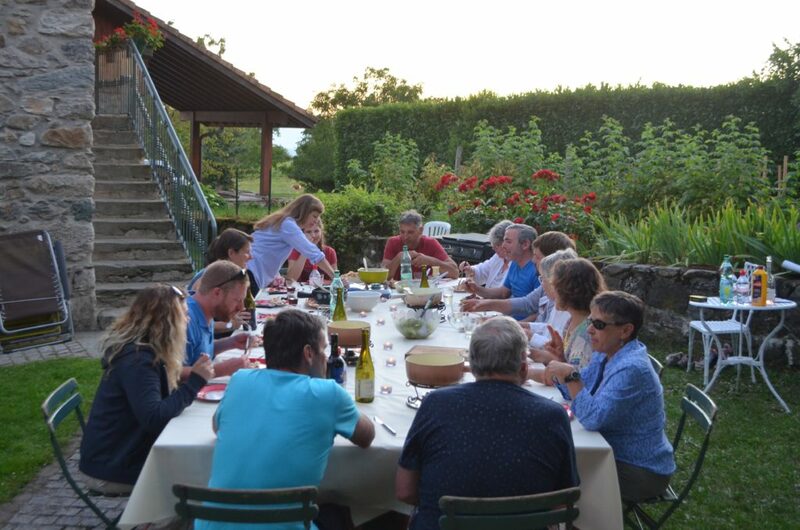 We were hosted to meals in the intimate setting of people’s homes, “off the beaten track” restaurants, picnics in the foothills of the Alps, and fondue set outdoors on a luminous summer evening. We met the cows that made the cheeses we ate, hiked a trail with cowbell “music” sounding in the distance, and enjoyed a clear view of Mont Blanc. We visited local food artisans and tasted the fruits of their life-long passions. I ate new and familiar foods and savored each and every one, in part because they came infused with the respect and love of those who made them. Amidst these incredible group food and dining experiences, there was also time for more personal solitude that is valued by me, and perhaps others. Quiet time alongside an Alpine stream, morning swim in Lac Leman, meditation in an old church, strolls through Thonon-les-Bains and Yvoire, quiet and not-so-quiet conversations and gatherings with new friends, and a little sip of Armagnac to end each day. I would recommend this trip to anyone seeking an authentic engaged experience of Haute Savoie, and the lovely food, water, geography, culture and people produced in this part of France. I cannot speak highly enough of Aaron…he is fun, smart, insightful, a good problem-solver, fluent in French and the ways of Haute Savoie, tells great stories, and brings a rich educational and professional background to his work. I would go again anytime!